Politico: 40% Surge in Orders for New Ice Hardened Petroleum Transporters | Watts Up With That? Politico reports that Finland’s Ship Building Industry is experiencing a bumper year, as Paris Climate Agreement signatories celebrate the new global environmental accord, by massively ramping up oil and gas exploration and mining in the Arctic. The country’s icebreaker business is booming as the shrinking ice cap opens up new opportunities. HELSINKI — The Arctic is melting at an unprecedented rate, and that’s good news for Finland, the world’s leading supplier of icebreakers. Ice levels fell to record lows this winter. Some Arctic monitoring stations recorded temperatures that were as much as 9 degrees Celsius above normal. And this year’s maximum ice cover was even less than in 2015, which was also a record-breaking year. That’s bad news for polar bears and people living on low-lying islands, but the shrinking ice cap is also opening up new opportunities in this Nordic country. Offshore oil and gas drillers, especially from Russia, crude and LNG tankers, cargo ships, research scientists and militaries are pushing north because it’s more accessible due to the melting ice. They all still need icebreakers. Aker Arctic saw its revenues jump 40 percent last year to €14 million after it helped design ice breaking vessels that can carry liquefied natural gas, a technology that will be applied to 15 upcoming vessels. The fleet will service Russia’s $27 billion Yamal Peninsula project, meant to produce 16.5 million tons of LNG per year at full capacity. If this rise in activity is because of the Paris Agreement, imagine the boost to the Artic Petroleum Industry which the next climate agreement will provide. April 30, 2016 in Arctic, natural gas, petroleum. It is not an ice cap! And the ice is floating on the ocean, so its melting will not affect low lying islands. Ice is a land bridge, that’s why it will affect the people there. They can use boats but not when there is chunks of ice moving about. Mind you, small light aircraft are daily common here in Finland, seems to be loads of them for such a small country. For absolute ignorance that report has few equals – good grief! So in a few years you may be able to buy one of these babies at cents on the dollar (or Euro) as the ice comes back and closes down previously open areas of the Arctic during the cold season. Or maybe you will need them during the summer months and they may become even more valuable as the ice remains during the warm season. It is so hard to predict the future. But. But. But they said the ice is going to melt And the polar bears are going to die. This rise has nothing to do with the Paris agreement. This project was found & conceived long before Paris. Likewise, if you look at world wide assessments of petroleum potential, the arctic region has some of the greatest potential on earth …. And that is why companies / countries are exploring there … Nothing to do with the Paris agreement or thoughts about global warming- it is simply going where the prize is. yeah…either that or some smart people with lots of money think it may be getting much colder in the coming years and decades. Do you suppose that people who explore, produce, and transport oil for a living just realized that there is oil up there? Or are they maybe thinking that if we return to conditions that prevailed back in the days when the Titanic hit a massive iceberg on the way from Britain to New York, that maybe they best have some beefier ships to do their business with? Because NEWSFLASH…there is oil in warm places too, and on dry land via fracking there is more oil than the world knows what to do with if the price stays high enough to support new exploration and drilling…which it did not for long do once the fracking had been underway for a few years. So yeah…they are building a fleet of very expensive ships for transporting oil in icy conditions, even though Arctic oil explorations projects are being cancelled even when they are well along and billions spent already. Perhaps they are also hedging against the possibility that with hardened ships, it may soon be possible to get around via the over the top of the world route…for a few weeks in a good year, if they are lucky, but in the meantime they will spend billions on new ships just in case, and spend more on fuel to sail around in those extra heavy ships to…just in the off chance that they may occasionally need them. I think it is obvious they are expecting much colder conditions in the years ahead, and a surge rather than a slow acceleration means they have seen something to lend new weight to this possibility. The ice generally moves farther from shore near Russia than the US and Canada. What I find surprising is that they didn’t just run a pipeline south to the Russian gas grid. Maybe there is a race to see who can supply the cruise ship when it gets stuck later this year? +1 It must take minimum year+ to build these ships. Sure nuff, if the Arctic is melting …. then now is the time to get up there, lay claim to your NG field, put your NG extraction infrastructure in place ….. and then who the hell cares iffen it freezes back up. I remember the Manhattan, a semi-hardened tanker run to Prudhoe Bayback when they were doing feasibility studies on the Trans Alaska pipeline. As I recall, it sorta worked. Tom – yes, the Manhattan worked fine but a pipeline was much more cost effective – even with the costs quadrupling over the original estimates for the pipeline. The voyage of the Manhattan showed transporting by ship was possible, but not economic and higher risk than a pipeline. There are some great documentaries on the net about the building of the pipeline including the Manhattan voyage. From the article: “HELSINKI — The Arctic is melting at an unprecedented rate, and that’s good news for Finland, the world’s leading supplier of icebreakers. 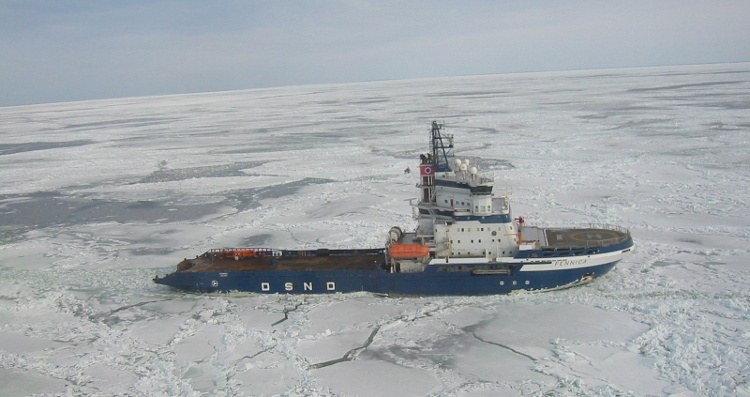 Because, because – when ice is blocking the northwest pssage anyway you don’t need a FLEET of icebreakers. I’m confused. I thought that the artic ice cap was actually growing, not rapidly shrinking. Given all the conflicting information coming from various different sources, it is hard to say what is happening to the ice cap on Greenland or the sea ice in and around the Arctic Ocean. They’re not saying that the sea ice is going to submerge islands. They’re saying that they’re going to put so many more ships in the ocean that they’re going to submerge islands. You crack me up AnonyMoose! hmm – wondering what this number actually is I’ve come up with a first estimate of half a picometre. So, pulling all shipping out of the ocean will probably have the same effect on sea level as the Paris accord. > I’m confused. I thought that the artic ice cap was actually growing, not rapidly shrinking. It bounces every few years, but if you compare 1980 / 1990 / 2000 / 2010, it has definitely been shrinking for the last 35 years. I hope 2020 to be above 2010, but that is merely a hope and not backed by evidence. And comparing one year to the next is really a waste of time. 2005 is roughly the average year for 2000-2009. 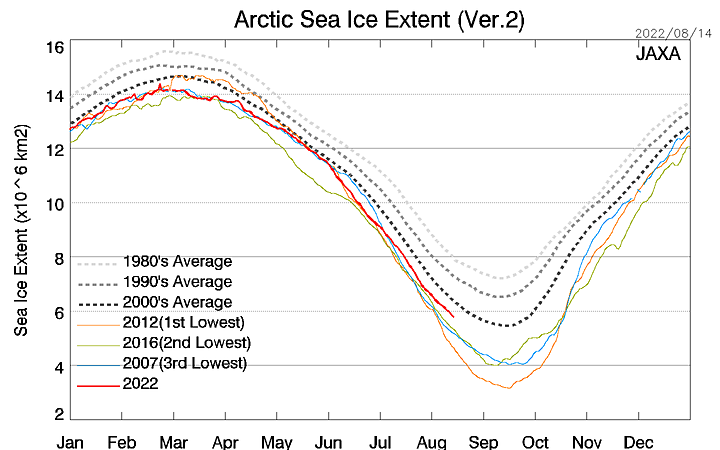 If you compare it to 2010-2015, every year this decade has lower ice extent than 2005. No meaningful bounce back yet. I’ll be very surprised if 2010-2019 averages above 2000-2009 in arctic ice extent. That nsidc graph is fun. One year you should plug in is 2006. It actually had less ice than this year, at this time, (while 2012 was “above normal” in late April). 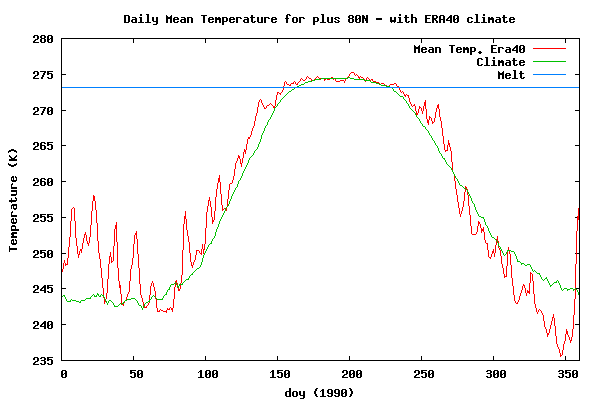 Later on 2006 went on to a nearly normal minimum extent, while 2012 set the record low minimum. I keep reading stuff that makes it plain Russia is prepared to invest heavily in keeping those sea-lanes open at considerable expense, even in a colder climate. They are now talking about “floating platforms” even bigger than the huge icebreakers, which to me sound a little like aircraft carriers, because you will be able to land jets on them. Need to remember that they prefer 15% ice as the metric. These ice breakers go through 100% ice as long as its not too thick. The nuclear ones can go through 2.5m thick ice at 10 knots. That’s most of the Arctic including the North Pole even in March. They really do not need the 15% ice extent to drop for them to be commercially viable? I’m confused about how ice floating on water and melting will make a measurable difference to sea level. How is CO2 the cause of this ice loss? Warm oceans, not CO2 is the result of the ice loss. One key difference lies in the nature of ocean circulation in the two hemispheres. The North Atlantic Ocean has a strong ‘meridional’ (north/south) circulation that delivers relatively warm water to high latitudes. The Gulf Stream and North Atlantic Drift Currents are the surface components of a much larger system (the thermohaline circulation) that includes deep water currents that flow back south along the ocean floor (see The coast and adjacent seas for a discussion of deep water currents). With the connection between the Atlantic and Arctic Oceans between Greenland and Scandinavia, warmer seas and moist air masses have a stronger influence at high latitudes of the Arctic compared with the Antarctic. An important effect of moist air masses originating over the North Atlantic Ocean (and the North Pacific) is that they release heat at high latitudes when the vapour they carry turns into ice crystals or liquid droplets in the atmosphere to form clouds (and sometimes precipitation). This process is referred to as the release of latent heat. It is interesting to note that the coldest recorded temperature in the Arctic (-67.8°C) was measured in an area far from the influence of the sea – at Verkhoyansk, north-east Siberia. Arctic Ice looks normal to me. If you look at the date on the bottom axis, it hasn’t been updated for a while due to the satellite sensor failing. 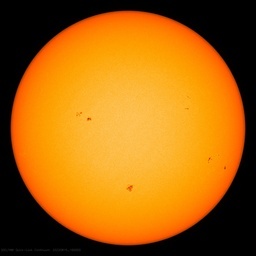 Which puts us in a conundrum .. the AGW folks have to stop yelling about the sea ice loss as there is no data indicating such. Prior to all this, the real issue in the Arctic has been the pool of warmer water up in the Barents Sea, which has caused lower ice totals in that part of the Arctic this winter, along with causing warmer air temps north of 80 deg latitude. According to the color scheme in the maps, the bright red indicates the water is near the boiling point /s so it may take a while to radiate off into space and return to normal. But with the very cold water in the N Atlantic (“blocking the Gulf Stream” as one person claimed), it should all return to normal and our return to the path to the next ice age will resume. No there is still this…. Goog intel. Time to load up on DynaGas LNG Partners (DLNG). 9C warmer this year means -26C rather than -35C. Seaixe forms at -2C. The low maximum extend has to do with wind and waves, as the metric is >15% ice counts as all ice for that pixel. So how compact the seaice edges are matters a great deal. Yup, which makes it all too easy for those given to shady manipulations of the data to paint the supposedly disastrous scenarios they favor us all being duped into believing. The thing they have never explained with any clarity is just what disaster will befall us if the frozen wastelands capping the planet become somewhat less frozen from time to time. Still means less ice (extent & thickness) has been formed. 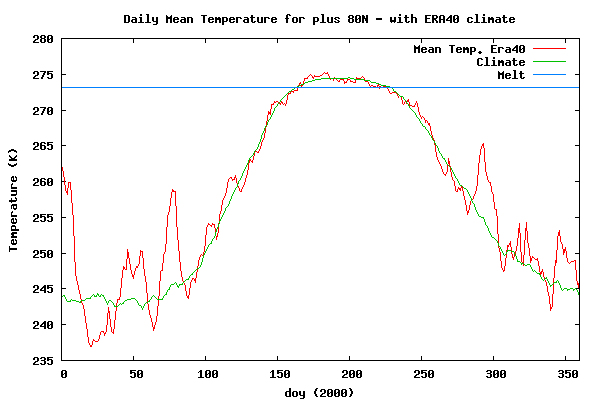 Also ice temperature may be higher relative to other years when going into the melting season. It means squat since it is waaaay below freezing. If ALL of the ice melts away during the short summer months,it will be what it was for long periods of time in the early part of the Holocene,while the CO2 level was around 260 ppm. Make up some other bogus explanation please. So you mean it means squat how cold it is with respect to how much ice is formed and how much energy is needed in summer to melt it? Really? Ok, noted! Ha ha ha, when will you stop making a fool of yourself here? -26C is well below the freezing point of salty water,it is a hard freeze. Water will freeze easily at that temperature. you never did address the main point of ristvan,could it because you know he is correct? And how thick will the ice get at -26°C relative to -35°C? I explicitly mentioned the effect on volume instead of extent alone. “Ice levels fell to record lows this winter. Some Arctic monitoring stations recorded temperatures that were as much as 9 degrees Celsius above normal. And this year’s maximum ice cover was even less than in 2015, which was also a record-breaking year. April 30, 2016 at 12:10 pm : Winds have compacted ice area; volume has grown; arctic cold has expanded, as of right now; North Atlantic is colder as the cold cycle gathers way there for c.32 of c.64 years as usual. Notice that Wagen completely ignored the chart from 1990? Wagen have you ever been in -26C weather? That was for year 2000.meanwhile can you spot the MELT line on the charts I posted? An average arctic temperature of -3°c would cause the same amount ice as a temperature of -12°C? Are you kidding me? Same goes for -26 and -35! Less ice formation in winter means less energy needed in summer to melt it. “It means squat since it is waaaay below freezing. If ALL of the ice melts away during the short summer months,it will be what it was for long periods of time in the early part of the Holocene,while the CO2 level was around 260 ppm. OK, but I’ll just give you some basic logic. It was “waaaay below freezing” – but it was not as far below freezing. Ergo – not as cold – not as much sea-ice formation. Simples. You do know that there was greater TSi during he HCO. Thereby overcoming a lesser GHG content. it was also dark too,which mean NO direct sunlight around to melt the ice during the winter. A Polar night is between September to March. Yes it is indeed waaaay below freezing. In the polar region it is BELOW freezing about 90-95% of the year. I see you moving the goalpost here since you absurdly try to explain away the obvious failure of LOW CO2 causing the massive melting of huge continental glaciers that used to bury most of Canada and northern USA, with your unconvincing Higher TSI level. You are being silly here. I begin to wonder if Wagen,lives in a tropical region since he seems to think -15 F or -26C is not very cold enough for him to think Ice will not freeze up fast enough,but he seems to forget that it stays below freezing sometime in Late September to October and stays that way for around 200 + days in a typical year in a row and with no direct sun to tickle the developing snow and ice. Thereby plenty of time for the ocean surface to freeze up to the usual area. Have you ever been outside naked in -15 F weather,Wagen? How long do you think you will stay unfrozen in it? You left out a few details such as LENGTH of freezing time and NO sunshine during the fall to spring part of the year. The conditions favorable for ice is about 2/3 of the year ,based on air temperature. Hi Wagan. You need to see in more than two dimensions. The warmer temperatures indicate heat was coming from somewhere, to be lost upwards into the starry void of the sunless arctic night. One place it came from was through a loopy (meridienal) jet stream, fueled by the warm El Nino-fed atmosphere to the south, but that jet stream led to a stormy arctic, which cracked the ice and created leads of open water that in some cases were miles across. Check out the satelite pictures of the Beaufort Sea (which always seems to get cracked worst) and you’ll see plenty of evidence of such leads. The new ones are the darker cracks, but older cracks froze over, and are ghostly cracks of light gray that you can hardly see in the “old” ice. If there were lots and lots of those cracks last winter, then was not the -30(F) air exposed to +29(F) water? Would not that warm the air, just a wee little bit? And then, would not that heat be lost up to the void of outer space in the perpetual darkness? And how about other effects? Is the arctic ocean warmer? It had its comforter of sea ice pulled aside, and was exposed to cold air. How about the amount of sea ice? When a lead is opened that is five miles wide, and temperatures are so far below melting, what happens to the five miles of ice that is moved aside? It crunches up like an accordion. But does that five miles of water stay water, at -30? Would not five miles of new ice be swiftly formed? And does not this create a lot more ice than winters when winds are calmer and ice is undisturbed, even if such winters have colder temperatures? Still no one explains why the case that ” -26C rather than -35C.” causes less ice to be formed, has as a consequence that less and warmer ice is melted in sinner? The demand for vessels with reinforced hulls has nothing to do with the expectation of less ice in the Arctic, and everything to do with technology and economics. This includes Russia’s fleet of very capable nuclear powered ice breakers, the recovery of gas and oil in Siberia, the inability of Egypt to properly manage the Suez, the demand of China for more goods from the west, blah, blah, blah … Even if the ice increases over the next 20 years look for Russia to have a very substantial merchant marine presence at the top of the world. How do we know this since there hasn’t been any new data for about a month now. Are there any alternate data collection satellites/etc. that have updated reliable information? Or are are we just guessing now again? Wagen and tony, you guys have short range vision. First off Sea Ice is cyclical, driven by wind and ocean currents, as much if not more then atmospheric T…. And prior to that, in the “blip” you know the warming that was mostly erased, arctic sea ice declined rapidly. FACT, there is currently more ice than the average of the past 9000 years. And global sea ice has been overall average, sometimes well above the satellite record average, going on five or six years now. There is no sea ice death spiral. All the alarmist choir like Bill Nye, Al Gore, and Jim Hansen plus many others, were and are wrong. It seems they’ve conveniently forgotten that the tenets of Warmist ideology state that fossil fuels are evil, so this sort of exploration would also be evil. Hilarious, too, that they can be so blase about their mythical endangered polar bears and drowning low-lying islands. They? Who do you mean by they? Politico? The Finnish icebreaker builders? Or still some others? Or whose polar bears and islands do you mean (Finnland has no polar bears, do you mean the Russians after all?). Impossible for me to tell from your comment. Politico, and all purveyors of the Warmist claptrap, or whichever portions are convenient to them. Oh, Wagon, I guess you missed this gem “That’s bad news for polar bears and people living on low-lying islands”. So, politico reporting on booming icebreaker business means they have ‘conveniently forgotten’ and are ‘blase’? Ah, OK.
Btw, I explicitly mentioned polar bears and islands (should have given you a hint, if you fundamentally read my last comment to the end 😉 ). Wagen, you missed the part where Bruce was making fun of believers like you about the alleged Polar Bears being an endangered species. I was inquirying about the mythical ‘they’. Happens to be politico. you wrote this in response to Bruce that you muffed badly since his counter reply shows you didn’t read it that well.He never mention Russia,Finland,Utopia,Midway…..
“Oh, Wagon, I guess you missed this gem “That’s bad news for polar bears and people living on low-lying islands”. Asking what ‘they’ refer to and giving several options based on the article ATL is different from the nonsense you interpret here. I accept he finds politico garbage. Do not agree that a report on icebreaker boom citing the industries quotes on why the boom is happening is loathfull. I have not once talked about whether the Icebreaker boom is good or bad.I keep pointing the fact that you missed the obvious that Bruce never cited nations as low lying islands. One more time: ““That’s bad news for polar bears and people living on low-lying islands”. You asked if he was talking about Russia,Finland as possible sites of low-lying islands. Were you thinking that Russia or Finland as possible low-lying islands…. Ha ha ha. It is not even close to a typo here. Meanwhile you misspelled Finland. You are really that stupid Wagen? Russia and Finnland have islands. Finnland? What is that? A Finnish themed park? Wagen, their Islands are not named Russia or Finland (with ONE n). Still digging I see. Wagen, that is a fried egg in the bunker, ad you are already in triple bogey territory. whenever the body of the message houses words like arctic, ice, island, oil, transport and so on. I guess England has a wheat shortage, why else would you load a bulk carrier in Minnesota and transport it all the way there. I’m sure the math must work out for everyone involved. Oh trust me they still need ice breakers to actually break ice, there is increased demand for breakers simple as, it’s got nothing to do with the health of the ice. More trips are being made. I also read somewhere, cant remember, that Canada and Finland and co could be planning to share ice breakers. Australia is purchasing a new icebreaker, more powerful and stronger. Must need it for the thinning ice. What a great idea…most icebreakers…break up more ice…and make it easier for more ice to be blown out and melt.. If it’s cold enough, the ice will just grow again. If not it wont, why fret over melting ice, from the outside humans must look hilarious scurrying around fretting and trying to stop ice melting. Of course the Finns realize the Ruskies and Chinese want to encroach on the whole Arctic. So why not invest in a bit of deterrance? I’m sure “Fennica” can be quickly retro-fitted. When Finland was under economic treaties with the Soviet Union after WWII the major export from Finland to Russia was ice breakers. This reminds me of an anecdote from that time. The Russian Government had ordered a large ice breaker, and before building is started they go over the drawings with the Finnish contractors. The Russians notice a room named Sauna. “What is that for?” they ask. The Finns explain: “We always have a Sauna on a ship this size to keep the crew sane, healthy and happy.” ” And how do you use it?” the Russians asked. “Well, you heat up the Sauna to as hot as you can stand it, and then everybody sit in it naked until they can take it no more, then run out and jump into ice cold water for about one minute, and so they feel good for the rest of the day,” the Finns answered. The Russians looked bewildered and said: “You really do that? You mean, mixing officers with regular crew? We must have two Saunas, one for the officers and one for the crew.” So the Finns added an Officers Sauna to the plans, built the ice breaker, and at the inspection the Russians reacted in horror. “What?, the crew and the officers have identical saunas with the same wooden benches? You must make the officer’s sauna more prestigious!” So the Finns copper clad the benches in the officers sauna! Less ice means we will need more ice breakers???? He’s going to have to actually explain that one, not just assert it.